Kia Proceed and Ceed GT confirmed | What Car? 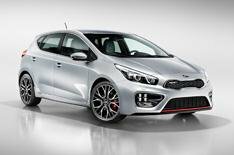 The Kia Proceed GT and Ceed GT have been unveiled at the Geneva motor show. Teaser images of the hot Kias have already been released, but the Geneva motor show will be the first time the cars have been seen in the metal. The two cars are powered by a 201bhp 1.6-litre turbocharged petrol engine that's mated to a six-speed manual gearbox. Kia says both the Proceed GT and Ceed GT will have a 0-60mph time of 7.9 seconds. Styling changes over the standard cars include aggressive-looking bumpers, a rear spoiler, mesh grille, 18-inch alloys, red brake calipers, LED daytime running lights and twin tailpipes. Inside, both GTs get Recaro seats. Production of the Proceed GT and Ceed GT starts in Slovakia in mid-May. The Proceed GT will arrive in early summer with the Ceed GT coming a few months later. Prices and specifications will be confirmed closer to the cars' on-sale dates, but expect the Proceed GT to start from around 22,000, with the Ceed GT from 22,500.